It is officially, if not exactly, part two of the 2011 season. The Meadowlands’ Grand Circuit run, concluding with the Hambletonian day’s parade of popular pacers and trotters, marked the middle. Due to schedule changes, of course, a few freshman pacing stakes were held over for the final two weekends at the New Jersey oval. This weekend the frosh- filly pacers have a single elimination to fight for their Sweetheart Final positions. Colt pacers meet for their event, the Woodrow Wilson Final, next week but do not have a prep or elims. Also at the Big M, older pacers continue their relentless war against one another in a pair of elimination divisions for the William Haughton Final the following week. Many of the sophomore stars that were included in the classy cast of characters that crowded the Meadowlands on Hambo day are back this Saturday, Aug. 13. Four New Jersey Sires Stakes (NJSS) finals of both sexes and gaits of the divisions meet in lucrative mile races. It’s a long weekend that starts off the second half of the season, as a major feature on Sunday, Aug. 14, brings together glamour-boy pacers for over a half-million Canadian dollars. Flamboro Downs presents the Confederation Cup, one of the rare events left that uses the heat format. Tioga Downs will host a slew of state-bred stakes on Aug. 13 and TwinSpires offers points to those bettors taking on the challenges there. Check that out by clicking here. Get a free account and follow me on Twitter. It’s informative, educational, witty and wild; it is certainly unlike any other handicapping-oriented stream on the Internet. What is best about it is that it has revealed many harness winners to followers. 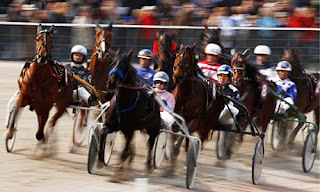 Canada’s Flamboro Downs holds the Confederation Cup (CC) for soph-colt pacers on Sunday, Aug. 14. At press time we do not have the draw of the two elim heats which will determine the field for the final on the same program. But we know which horses are in the draw, so we can narrow down the best for you. The CC attracted 16 horses. One of them is Up The Credit, the North America Cup winner, who may not be as good as people think. He may not adapt to the half-mile well. 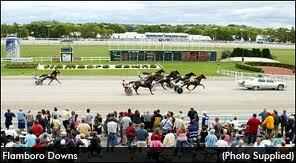 Plus, he did not do well in the Meadowlands Pace elim and had to settle for a victory in the consolation. “Credit” will be over-bet. Bestofbest Hanover will try to redeem himself after a third-place finish in a conditioned event on July 30. Mystician may also get a home-turf advantage. He has mainly stayed in Canada for the Ontario Sires Stakes and has traveled the Flamboro oval several times. Rollwithitharry has done well on the half-mile oval in New York. The final horse to watch is Wink N Atcha. He was third in the Meadowlands Pace and is starting to improve. On Saturday, Aug. 13, the Meadowlands presents state-bred finals for the three-year-old colts and fillies on both gaits. Race 2 is for filly pacers with a $175,000 purse. Four gals come from last week’s Mistletoe Shalee, won off of murderous fractions set by Krispy Apple from the 10 hole. She gets post 7 here and won’t have to work so hard, though she will be the favorite. It may be dangerous to let Pretty Katherine go off anywhere near the 20-1 she offered in the “Mistletoe.” She beat this field at the Big M before. Watch how the public treats her. As well, Myluvmylife almost made the board in the Mistletoe and should do better here. The filly trotters are next in Race 3’s 10-horse field, also for $175,000. Three of these gals made it to the Hambletonian Oaks final, one of them being a horse to watch in here, Wincinnatti. She went to the lead and was passed at the end of the “Oaks” final while speed was not in the track’s favor. She trotted her best mile in a division of the NJSS, resulting in a victory. Also watch Lost Symbol. She made a bad break in the Oaks elimination. Before that, she was third in the Del Miller. She was also her best in these state affairs. The third NJSS offers $175,000 for three-year-old colt trotters. There is no clear favorite in here, since the quality of this field is high. VC Chocoholic won a leg of the NJSS on July 22 and made a break in the Townsend Ackerman on Hambo day. He has done his best in this series and gets the post advantage (3), while since Manofmanymissions drew post 10. Also watch Charlie De Vie. He may be back to his old self as he had shoeing adjustments in the Hambo elim and he was off Lasix. He is back on Lasix and may be able to stay flat. The fourth $175,000 NJSS is for three-year-old colt pacers. Big Jim will be the likely public choice as he was victorious in his NJSS and suffered from the fiery duel he had with Roll With Joe in the “Holmes” last week. Shadyshark Hanover really showed what he is capable of doing to a hot pace on Hambo day and his original driver, Jim Morrill Jr., is in the sulky to try for another win after his 21-1 victory in the Holmes. He may not be such a long shot after that race but he may have developed a lot more confidence by taking this group for a ride. There are two eliminations for the prestigious William Haughton Memorial for Free For All pacers. The top five finishers in both elims will go to the final next week. In the first elim, the field is wide open. It features many of the best pacers on the continent, like Bettor Sweet, Foiled Again and We Will See. The two horses in this field that could get the trip are Alexie Mattosie and Delmarvalous. Alexie Mattosie showed his best in the U.S. Pacing Championship, finishing second. Delmarvalous finished third from the rail in the “Championship” division and gets another good post. Some wild results have occurred in past “Haughtons” so don’t be surprised if Delmarvalous pulls off a shocker. In the second elim, it is a tight field. St Elmo Hero is starting to rebound and so is One More Laugh. Although the quality of the Invitational horses in Indiana isn’t as good as the east coast, St Elmo Hero, who is coming off an Indiana Invitational, has already attempted to go against Free For All horses. The quality of this elimination may give him an advantage. The frosh-filly classic is missing one of the top pacers this year, American Jewel. Many of the best filly pacers have fallen in the Sweetheart (Ace Of Pace was one that finished third to longshot Honky Tonk Woman), so we better be on our toes when betting. Handsoffmycookie is the likely public choice, as she is three for three on the half-mile ovals of New York. Despite her questionable pacing style, Rockin Belle may be the best in here. Before her most recent start, she went on a bad break and then came back and upset. If she gets the top, she will be in serious contention. Bettor B Lucky may also be in the mix. She was used hard in her first pari-mutual start then came to the Meadowlands in the Countess Adios, closing late to finish fourth.